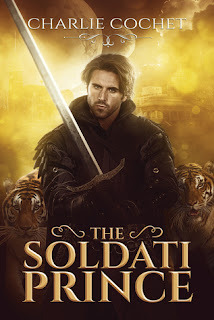 The Soldati Prince is the first in the Soldati Hearts series by author Charlie Cochet. This is a really good start to a series. There is chemistry, and action in this book, along with enough information to make me want more, and see where this series will go next. Riley, he is closing his bakery when two men come in. They ask for him and then turn into shrieking monsters. Riley thinks he has lost his mind. He runs into the alley way and two tigers rescue him. He now knows he has lost his mind. Riley is the kind of character I love. He is feisty, brave, and sassy. He might be a human in the world of paranormals but he has a strength they all need. Khalon is a tiger shifter. Riley has the mark declaring that the human is his. Khalon is less than thrilled to have a human mate. Khalon when we first meet him is kinda of an arrogant prick. But once we get to know him we just learn he is very careful with his heart. He is a good person. A great leader, and very strong. He demands the same from those around him too. Over all a very intriguing start to a series. I would love to read more. Find out more, have some more world building, and find out of course who falls in love next.